- Vol. 4, no. 89 (Mar. 8, 1943)-v. 6, no. 48 (Sept. 11, 1943). - Available on microfilm from the Library of Congress, Photoduplication Service (Japanese camp papers). - Published at the Tule Lake Relocation Center established by the War Relocation Authority. Tulean Dispatch Daily . (Newell, CA), May. 18 1943. https://0-www.loc.gov.oasys.lib.oxy.edu/item/sn87062142/1943-05-18/ed-1/. 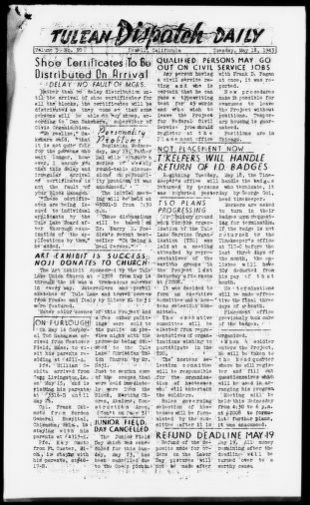 (1943, May 18) Tulean Dispatch Daily . Retrieved from the Library of Congress, https://0-www.loc.gov.oasys.lib.oxy.edu/item/sn87062142/1943-05-18/ed-1/. Tulean Dispatch Daily . (Newell, CA) 18 May. 1943. Retrieved from the Library of Congress, www.loc.gov/item/sn87062142/1943-05-18/ed-1/. Japanese-American camp, war emergency evacuation,[Tule Lake Relocation Center, Newell, Calif.] 1 transparency : color. | Photo shows eight women standing in front of a camp barber shop. Japanese-American camp, war emergency evacuation, [Tule Lake Relocation Center, Newell, Calif.] 1 transparency : color. | Photo shows five smiling women.